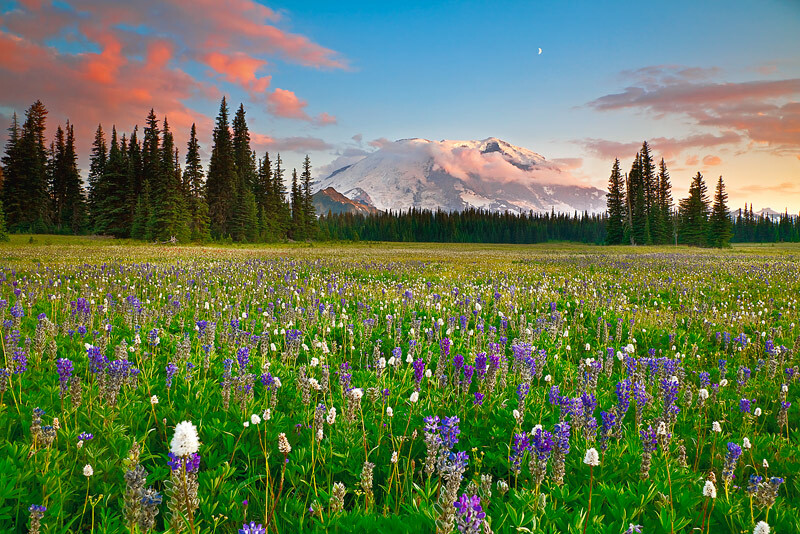 An incredible sunset on Mount Rainier with a proliferation of wildflowers in an area called Grand Park. This is a difficult area to reach without spending at least one night in the backcountry. The problem is the closest backcountry camp sites to this location are almost two miles of steep hiking away. The mosquitoes were so intense here - I would not change my lens for fear of bugs getting on my sensor. I was wearing gloves, a head net, a long sleeve shirt, and 100 % DEET, and l was still chewed alive. On the hike back, the trail was so dark and poorly maintained, I almost got lost. Nevertheless, I wouldn't hesitate to do it again.... Photo © copyright by Michael Greene.